She’s mad as hell, and she’s not going to take this any more. "It’s hard being on the sidelines, especially now with everyone screaming 'Fake News,'" explains the legendary fictional TV-news superstar Murphy Brown (Candice Bergen). She’s raring for a comeback to take on the Mad Tweeter-in-Chief as a reborn mad prophet of the cable-news airwaves, Network’s Howard Beale in an "Original Nasty Woman" sweatshirt. 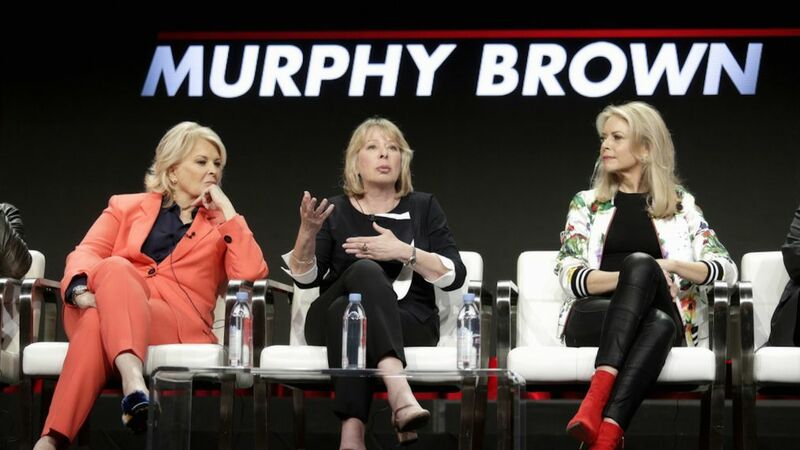 Bergen won five Emmys as the outspoken Murphy in the classic original’s CBS heyday (1988-98), and 20 years later, she still seems in her prime — even if Murphy Brown the revival is creakier in its blunt and jokey speechifying. It’s clearly cathartic for series creator Diane English to use her glamorous alter ego to name names (including the president and his press secretary), though it can’t help feel less than groundbreaking after we’ve spent the last few years savoring the savagely satirical likes of John Oliver, Stephen Colbert, Seth Meyers, Trevor Noah and especially Samantha Bee. Joe Regalbuto, Grant Shaud, Candice Bergen, and Faith Ford. Tweaking the powerful is a function of great comedy, but lecturing feels like preaching, even to the already converted (who, face it, are more likely to be watching). While it’s good fun for Murphy to don a disguise and French accent to sneak into the White House press briefing room from which she’s been banned, it’s less so when she gets on her soapbox in front of Sarah Huckabee Sanders, seeming more self-righteous scold than comic crusader. In the third episode, Charles Kimbrough makes a welcome cameo as former anchor Jim Dial, whose rigid demeanor is softened by the puckish Tyne Daly as Phyllis, new proprietor of late brother Phil’s bar. Some gags flop by reminding us too predictably how much time has passed: Murphy being weaned off her flip phone by the requisite tech millennial (Nik Dodani), Corky experiencing on-air hot flashes, a "Silver Singles" dating app for eternal bachelor Frank. But the new Murphy does have one smart multi-generational ace up its sleeve: the charming Jake McDorman as her grown son, Avery, whose new cable show as the "voice of reason" on the conservative "Wolf" network is the time-slot competition of Murphy in the Morning. Mother and son have an easy, affectionate rapport, and he softens her edges while pricking her pretensions. "Think before you tweet, Mom," Avery advises, after setting up her account. "Shows have been canceled for less." Little chance the new Murphy Brown will self-destruct like Roseanne. Wisely, the revival is limited to an initial 13-episode run, by which time Murphy will presumably have blown off plenty of steam. Given the times we live in, she may never run out of gas.